1. Visual sensory pathway is initiated primarily in the retina and ends in the primary visual cortex of the brain. Figure 1: The rod pathway. A large number of rods are converging on a single rod bipolar cell (RBC) with A17 and AII amacrine cells modulating the output. 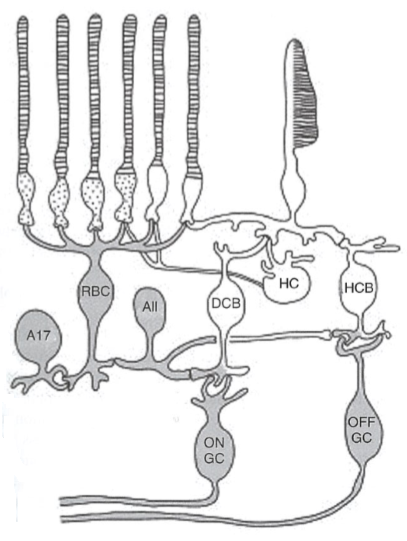 DCB and HCB are depolarizing and hyperpolarizing cone bipolar cells, respectively, that output to ganglion cells (GC). Their input and output are modulated by horizontal cells (HC) and AII amacrine cells, respectively. Figure 2. 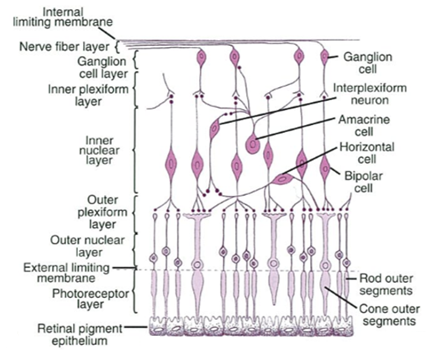 Plain of the retinal layers. All 10 cellular and synaptic layers are indicated. 2. Initiation of the visual pathway and process of the visual features are initiated by the photoreceptor cells (retinal neurons) responding to light and contrast. Photoreceptor cells are connected to ganglion cells via series of bipolar cells. The distal part of rods and cones (located in the photoreceptor layer and outer nuclear layer) are connected with the proximal part of bipolar cells and horizontal cells (located in the outer plexiform layer) and ganglion cells (located in the inner plexiform layer and ganglion layer) are connected with the distal part of bipolar cells and amacrine cells (located in the inner plexiform layer). 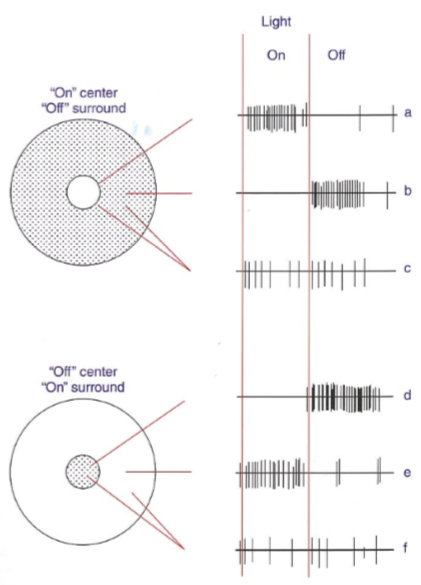 Opposite responses are observed in an off-centre-on-surround cell. The cell is inhibited by a centre stimulating light and activated when the light is turned off. (e) Activation of the same cell occurs when the surround light is turned on and inhibited when is is turned off. (f) When both centre and surround are illuminated (or in dark), the net result is moderate activation as the centre is inhibited and the surround is excited. 3. The signal activity is passed on to the optic nerve formed by the axons of the ganglion cells in the retina. Ganglion cells have receptive field responsible for responding to light stimulus. Each receptive field is composed of two regions, a centre and a surround, each responding oppositely to the light source. In case of “on-centre cell response”,if the light exposure is on the centre of receptive field, centre illumination will be increased and surround illumination will be decreased due to stimulation of on-centre cell and inhibition of the same cell via light exposure on the surround of receptive field. In case of “off-centre response”, if the light exposure is on the surround of receptive field, centre illumination will be decreased and surround illumination will be increased due to stimulation of off-centre cell and inhibition of the same cell via light exposure on the centre of receptive field. The most common neurotransmitter released as a response to the light stimulation is 'Glutamate' which works as the bipolar cell inhibitory. The rods and cones are synaptically connected to two types of bipolar cells (on and off cells). Steps: On centre bipolar cells and on centre off surround ganglion cells are used as an example. Presence of light in the centre of receptive field. Hyperpolarisation of the centre cones. Less glutamate (inhibitory neurotransmitter for on centre bipolar cell) is released at the synapse. Hence on-centre bipolar cell is depolarised as less bipolar inhibitory was released. Increased amount of glutamate is released at the synapse due to depolarisation. This will cause depolarisation of the on centre ganglion cell. Off centre bipolar cells will result in hyperpolarisation of the on centre ganglion cells due to different receptors at the synapse of the bipolar cells and causing an opposite response. The connection of centre cones and surround cones cones in the fovea with via acmacrine and horizontal cells. Antagonistic effect on the centre of receptive field. Occurs as the eye is trying to focus on the cencentrated (strong stimulation received in the surround) information rather than the information received in the centre which is not as concentrated as the surround information. Presence of light in the surround receptive field and darkness in the centre receptive field. Hyperpolarisation of the surround cones and depolarisation of the centre cones. Hyperpolarisation of the surround will release less neurotransmitter (glutamate) at the synapse. Hence the horizontal cells are hyperpolarised. 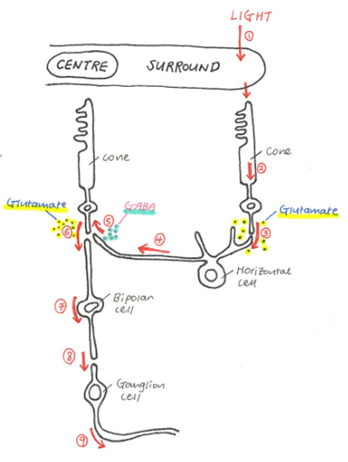 Stimulus on the horizontal cells will cause release of neurotransmitter called Gamma Aminobutyric Acid (GABA) at the synapse with centre cone and this will have no impact on the production of glutamate by the centre cone as hyperpolarisation of horizontal cells will not produce much of GABA. On centre bipolar cells are hyperpolarised as glutamate acts as an inhibitory neurotransmitter. Decreased amount of glutamate is released at the synapse due to hyperpolarisation. This will cause hyperpolarisation of the on centre ganglion cells. Figure 4. The primary visual pathway. The primary visual pathway entailing the retina, optic nerves, optic chiasm, optic tract, hypothalamus, dorsal lateral geniculate nucleus, optic radiation, and primary visual cortex. Source:Dale P. (2010) Brains how they work and what they tells us about who we are, 1st edn., New Jersey: Pearson Education. 4. 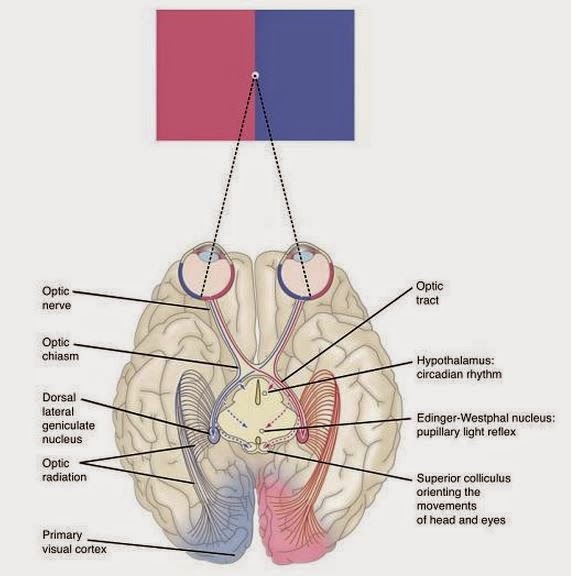 The signal passes through the partial crossing of axons at the optic chiasm (partial decussation) where left and right visual information delivered via the optic nerve cross to the opposite side of the lateral geniculate nucleus via the optic tract. The medial half (nasal half) of each retina receives light rays from the lateral portion of the visual field and crosses to the opposite lateral geniculate nucleus. The lateral half (temporal half) of each retina receives light rays from the medial portion of the visual field and remains to the same lateral geniculate nucleus. The right optic tract carries signals representing the left half of the visual field. The left optic tract carries signals from the right visual field. 5. All the axons synapse at the lateral geniculate nucleus and spread through the brain as the geniculostriate radiation. 6. The signal travels to the primary visual cortex in the occipital lobe. Specific rotation axis required for visual stimulus. Non specific axis will have no stimulus. Receptive fields include: dark bar, light bar and light-dark bar. Specific rotation axis of bars and edges required for visual stimulus. Non specific axis will have stimulus but less. Non specific to the positions of stimulatory bars and edges. Akers R.M. and Denbow D.M. (2013) Anatomy and physiology of domestic animals, 2nd edn., Iowa: John Wiley & Sons, Inc.
Aughey E. and Frye E.L. (2001) Comparative veterinary histology, 1st edn., London: Manson Publishing Ltd.
Dale P. (2010) Brains how they work and what they tells us about who we are, 1st edn., New Jersey: Pearson Education. James G.C. and Bradley G.K. (2007) Cunningham's textbook of veterinary physiology, 5th edn., St. Louis: Saunders Elsevier.